My friend sent me a fun package today, filled with all kinds of goodies! Among the loot were ARCs of Pandemonium and The Selection which she’s loaning me, as well as an adorable book of paper toys, some paper pretties, and library pockets. How did she know I’d been wanting those old-fashioned library pockets? I have no idea, but sometimes I think she is monitoring my online activities from hundreds of miles away. 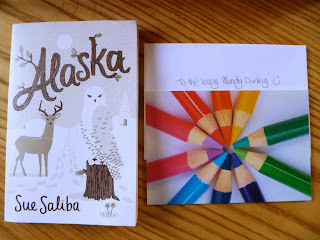 The lovely Nomes over at Inkcrush also sent along a beautiful Aussie book I’ve been lusting after, Sue Saliba’s Alaska, which is of course impossible to get here. I’ve been looking forward to this one for a long time, and to actually have my own copy is such an amazing treat! I also got tons of Australian candy to try out, which is super fun. My dentist is going to be really happy about that. Speaking of book presents, did you give any this year? I gave my 14-year-old niece and nephew copies of Unearthly and Anna Dressed in Blood, and I gave my best friend (who is a 31-year-old male, btw) A Monster Calls and Liesl & Po. I hope they’ll enjoy them as much as I did! Oooh :) I’m curious as to what Aussie lollies (saying candy sounds strange to me) you got!! And did you enjoy them?!! Nice! You’re a great friend. I’ve been wanting to try Liesl & Po. Those are the BEST presents! Color me completely jealous. I need to find out who I need to become friends with to start getting these beautiful ARCs; waiting for Pandemonium is killing me! :) As for book presents, for the first time in my life (I just started getting back into reading a year ago), I had a ton of books on my Christmas list and gave lots of books away as well: Vampire Academy and Divergent to my brother’s girlfriend, Delirium to a good friend, Liesel and Po to the boy I tutor, Water for Elephants and The Language of Flowers to my mom, and so many others. I love giving books; I feel like I give a piece of me when I gift a book I’ve loved! Yay, bookish presents! Love getting those. I didn’t get any books for Christmas aside from the Book Blogger Holiday Swap package but I did give books as gifts to my friends – Filipino chick lit for my high school friends, Anna and the French Kiss to one friend and Daughter of Smoke and Bone to another. Hope they enjoy reading the books! I know, I really am very lucky to have such good friends. :) What’s funny is that I gave my BFF books meant for a younger age group than the books I gave my niece and nephew, hee hee. I’m looking forward to reading everything. Thanks so much for your lovely comments! Love the cover for Selections, really eye catching. Hi – Love, LOVE your site design – Beautiful!!! It’s nice, I’m very curious about selection. Wow Flannery is the bomb! Great score! You’re so lucky, Wendy! I am dying to read Pandemonium. I hope you like it. I’m super happy for you, Wendy! I hope you enjoy them all. 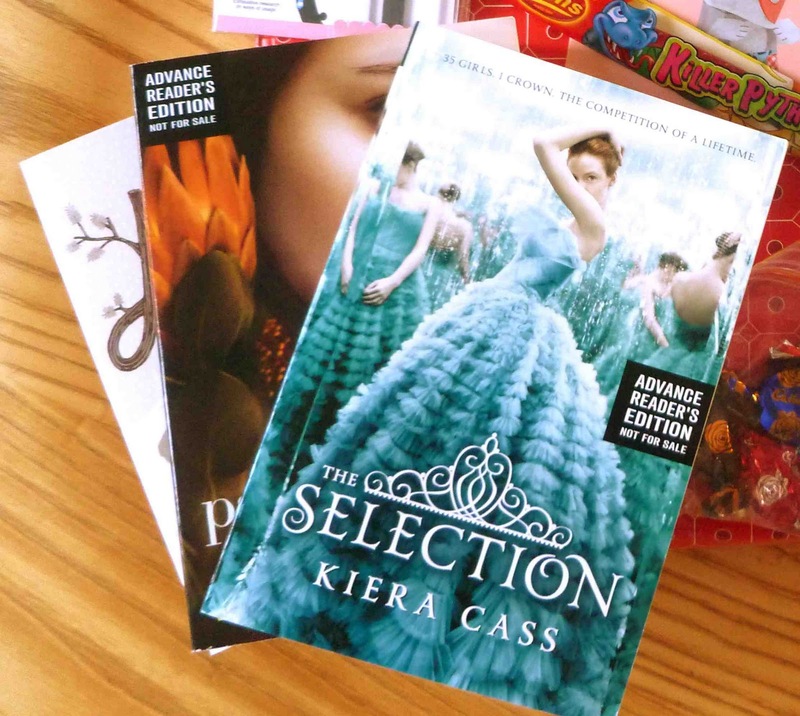 :) I know I’m looking forward to Pandemonium and The Selection! Pandemonium was exciting, hope you enjoy it! Yay! Look at all the pretties! Also, I have to say you’re AWESOME for giving books to your friends and family. I try to as often as possibly but my family doesn’t read much and I think my friends occasionally like something other than books. Lol. Ahhh Alaska looks SO BEAUTIFUL! I want it on its cover alone. I’m interested in what you’ll say about The Selection, I hope it lives up to its hype. Your book presents are wonderful! It’s so funny you gave your friend those books because they are actually the next two books I’m going to read. I am sooooo jealous. I loved Delirium!